I have nothing against Emma Thompson, but the idea of standing on climate change strikes me as a particularly ridiculous and graceless juxtaposition of concrete and abstract. It reminds me of one movie she was in, Love Actually. It has that song where instead of “love is all around us” they sing “Christmas is all around us”, making this particular bar of the song come across like a bump in the road. Logically speaking, there is a well known problem manifested in the phrase “standing on climate change”. What she’s standing on may be affected by the local weather, but weather is not climate. The impression I get is that it’s a desperate attempt to think of something crisp and creative to draw attention to the issue. Unfortunately, it’s clumsy. As is much of climate activism, which often seems to be about pushing square pegs into round holes. If it doesn’t work, push harder. Or sometimes, if failure becomes too conspicuous, try a different peg, but without checking the shape of the hole first. When I first read the blog post, I was thinking vaguely along these lines, so the harsh treatment of Emma Thompson seemed to me mostly self-inflicted. Then along comes a commenter who calls him/herself Agnostic. I have to admit this gave me pause. I find this post and the subsequent comments very disappointing. Is this really how you want to go about changing people’s minds wrt the science behind climate change? 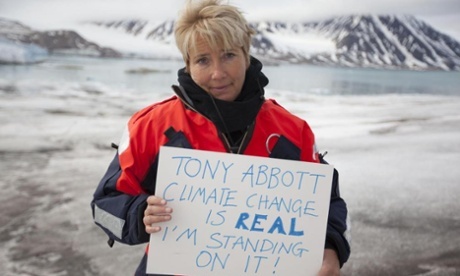 There are much much smarter and far better informed people than Emma Thompson who genuinely beleive man made climate change is an urgent threat. I would bet that most people posting here, and certainly Jo herself, at one stage was very concerned about the issue and would do what they could if the opportunity arose to promote action on it. I am pretty sure she thinks she is doing the right thing and using her celebrity status for something worthwhile other than as a photo op for gossip magazine or whatever. Suppose she were to read this blog post and comments? How would the condescension affect her views? Most people, reasonable people, once confronted with the evidence that undermines the case for catastrophic human influence on the climate begin a process of shifting their views – it takes quite a long time for the whole thing to sink in, as it should. There is a lot of complex information to digest, and you have to go against a prevailing orthodoxy, and get to the bottom of memes such as 97%, the worlds institutions, the IPCC, arctic sea ice, as well as the very strong and generally desirable Eco-concern about not causing harm. Here, she would read the derision and just think that skeptics are a bunch of idiots and “flat-earthers” who want to be free to trash the planet, and who could blame her? And what is wrong with using celebrity status to promote a cause? Would any of you object if it was to raise awareness of female genital mutilation in Africa, or drinking water quality, or land mines, or care of the elderly? That she (and others like her) is informed enough to be worried about climate change, but not sufficiently informed enough not to be is hardly unique or surprising. Deriding her for trying to promote an important environmental issue is hardly constructive to the debate. The challenge is to try to communicate to people like her of the policy consequences of an over confident conclusion based on highly uncertain and immature science. Well put, and several good questions. During the 1970s here in Norway, I was sometimes accosted by Maoists who wanted me to join them in a demonstration on the anniversary of the 1968 Soviet invasion of Czechoslovakia. Although I agreed with the cause, I always said no because I realized that I would be supporting their worship of Maoist China and the then current Chinese view of the world (World War Three was imminent among other weird stuff). I think a minimum of skepticism should be applied before supporting any cause, no matter how obvious it seems. I would certainly take the time to consider whether there was some plan of action that would realistically help reduce the problem. And always make sure the cure isn’t worse than the disease. In fact, female genital mutilation seems to be a useful example, at least from what I’ve been reading lately. Here in Norway, there are girls from Somalia and other relevant countries who have been subjected to it, but there is controversy and uncertainty about what has happened in Norway and what has happened before they arrived here. I’m not having a strong opinion on the facts of the case, but it’s clear that they matter. Very different approaches to the problem are required depending on how commonly it is actually practiced in this country. So what about climate? Does Emma Thompson understand what she’s trying to achieve? In this particular case, she’s objecting to policy decisions by a named politician. Wouldn’t it be reasonable to at least expect her to hear his point of view and his reasons for those decisions? “Seek first to understand, then to be understood” says Steven Covey. I haven’t heard Abbot’s reasons, but i’m fairly certain “there is no such thing as climate change” is not one of them. And given that, the argument Emma is holding is a straw man. To take it more from the top (or is that the bottom?) than Jo does: Of course climate change is real. Everyone agrees with that. There is some disagreement on what causes it, and even more on how serious the effects will be. Shouldn’t Emma Thompson at least be aware of this before trying to lecture politicians on it? Does she even understand what she’s saying? Or is she just parroting a cheap, misleading slogan? The changes we need, that the Arctic needs, must come from the top as well as the bottom. We need electric cars to be cheaper and more accessible. We want safer bike lanes in every big city. We want plastic bags to be banned for good. We need governments to stand up to the dirty industries that have for so long funded and controlled them, and to give us all an affordable chance to live our lives in a more sustainable way. So David Cameron knows how to make cheap electric cars, but the selfish sod is keeping it a secret. Good point, although our environmentalists will say that all that’s needed is what we’ve done it in Norway. There’s been a huge growth in the number of electric cars, and they are much more popular than in neighboring countries. The reason is good incentives, and allowing electric cars to use the bus lanes to whiz past the other traffic. And the incentives are supposed to stay in place until there are 50,000 electric cars on our roads. So they say. Unfortunately, that’s still less than 2% of total vehicles. And already, the buses are having trouble since one in five vehicles in the bus lanes are already private electric ones. In fact, right now in today’s news there is a debate going on about stopping this privilege prematurely, at about half way to 50,000. In any case, 2% doesn’t make much of a dent in our total CO2 emissions. We would have to get to the point where all families have an electric car. They need to be “affordable”, Emma says. The problem is that subsidizing them (relative to other cars) means we buy the car for a lower price and pay the difference in higher taxes or in higher healthcare costs, or whatever. Which means it’s not really affordable in a broader perspective. So, if “we” the people are so willing to do what’s needed, why don’t “we” just buy the expensive electric cars instead of having to pay extra taxes to make them cheaper? Perhaps the reason is that “we” aren’t so interested after all. All of this is (presumably) what Jo is hinting at. As much as I love Emma Thompson’s acting, I’m afraid she’s deserved the sarcasm.